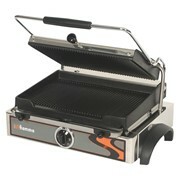 The SG1300 Synergy Grill is the new patented technology that creates a grill system that is faster, more economical, and able to produce superior results! 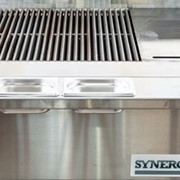 Synergy Grill's patented burner technology and natural ceramics, makes fat atomised into a dust and the moisture from the fats and oils is misted back onto the food. This means food produced by the Synergy Grill is more succulent and moist, ensuring a better tasting product for your customers. 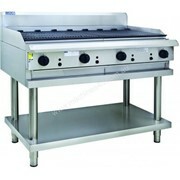 Even foods such as chicken or well-done steaks, which tend to dry out on conventional chargrills, retain their moisture and flavour. 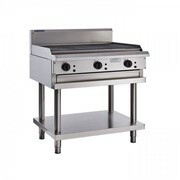 The Synergy Grill also has specially designed cast iron bars, which give a consistent, sharp and even brand and caramelisation to any food placed on the Synergy Grill. 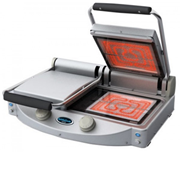 The secret is the ceramic heat bed and patented vortex gas/air mixture that combine to create a whole new era in grilled food, and no thermo-couples required. No fat means no fat tray. A range of models and accessories are available and all models come with the Synergy Lifting and Scraper Tools. 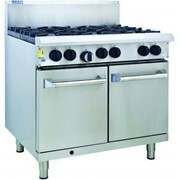 Industry Kitchens is unique in their skill set as an equipment distributor. With decades of experience in the hospitality sector, we're able to help you with your replacement equipment or kitchen fit-out, commercial kitchen design or front of house & uniform requirements. Our team is committed to helping you select the right equipment, making sure that it's fit for purpose. 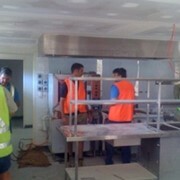 If it's an open kitchen or back of house it needs to look & feel right for the application. 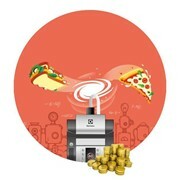 Mention HospitalityHub so Industry Kitchens can best assist you! Get a callback from an expert at Industry Kitchens to help answer your questions.